A quick update to let you know that Trippin’ is still going in the festival circuit through summer 2017, and the same team is working on their second feature film, My Ranger. My Ranger is a dramatic comedy in which a boy gets his first car and is on top of the world until he becomes convinced that someone is trying to steal his Ranger truck. The independent feature film will be shot in Austin, Texas in the Spring of 2017. Read more about where things are headed for both projects here on the My Ranger Blog. Trippin’ has been selected as an official film in ten festivals to date, in the US and internationally. We could not be prouder of all the support so far. Our festival circuit ride isn’t over yet…we’ve got a few more to go through the summer and eagerly await word for additional awards and nominations. Stay tuned to hear our future plans for Trippin’ after that! Trippin’ is going to the West Coast and will be screened at the Golden Gate International Film Festival. Lara Shah (our Katie) will be on hand to represent our Trippin’ family. Congrats to everyone involved and good luck! Producer & Director David N. Reyes and the X Horn Production team not only put together a beautifully visual experience, but created a unique blend between a reality show and a drama. In other words, this film gives you both…and is delivered in a perfect balance. This made for an interesting experience for the viewer since for a stretch you experienced the drama, then you transformed into the reality phase of the film, which is based on the premise of having Jordan Leuvoy (Nic) and Kathlen Brown (Allison) starring as emerging filmmakers hired by Oryan Landa as Sam who wants of documentary of the engagement from the time Lara Shah (Katie) says “I do” to the final dance at the wedding. Well, THAT idea – whether happening in real life or in a fictional story – is quite novel to begin with…so naturally it translates into an engaging story right from the start. Getting married? You’ll love it. Probably going through the exact same issues. Married? You’ll love it too. Probably will bring back a lot of fun memories. Divorced? Something for you as well since it may provide some ideas in case you decide to jump into a serious relationship again. Actually, no matter what your relationship status, this film is a fun ride, as a documentary, drama, and romantic comedy. To see more of the Father/Daughter reporting visit Film Festival’s website. 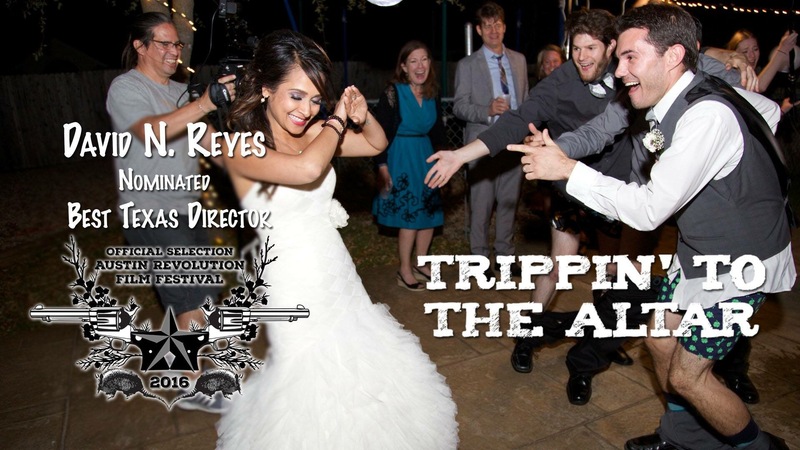 Trippin’s Writer/Director David N. Reyes has been nominated by the Austin Revolution Film Festival for Best Texas Director. But of course! We are BEYOND EXCITED to announce that Trippin’ was named Best Domestic Comedy at this weekend’s Ft. Worth Indie Film Festival. Congratulations to everyone involved, and thank you to all the fans! Our next big (really big) news is that our two lead actors have been recognized and nominated for their work in the film. Austin Revolution Film Festival just posted FB this year’s nominees in the Best Actor category. Lara Shah, our Katie, and Oryan West, our Sam both received nominations for Best Actor and Actress. This recognition is well deserved and to be celebrated when we screen at the Alamo Drafthouse on Slaughter Lane this September 21st! COME TO OUR AUSTIN SCREENING! Be sure to select which nights you want to attend–and make sure it includes Wednesday, September 21st! We would be honored to have you as a part of our Altar Party! Altar & Ft. Worth…we now pronounce, a premiere! We are very pleased to announce that Trippin’ to the Altar is an official selection of the Fort Worth Indie Film Showcase, nominated for Best Domestic Feature AND Best Domestic Comedy! We will be having our world premiere in Fort Worth on July 15, 2016. The Trippin’ to the Altar family is also very proud to be nominated by the The Monkey Bread Tree Film Awards in the category of Best Feature Made for Between $5,000 – $10,000. And to make us even more over the moon, we are an official selection of our own hometown Austin Revolution Film Festival 2016.